Not to be confused with the Taj Mahal, Taj Mahal Palace is located in Mumbai not in Agra. However, this hotel is almost as iconic as the world famous mausoleum that it was named after. The hotel is full of old world charm that one would think it was built in 18-19th century during colonial time when East India Company ruled India. Legend has it that Jamsetji Tata built the hotel in early 20th century because he was refused entry into the Watson's Hotel which was restricted to whites only. 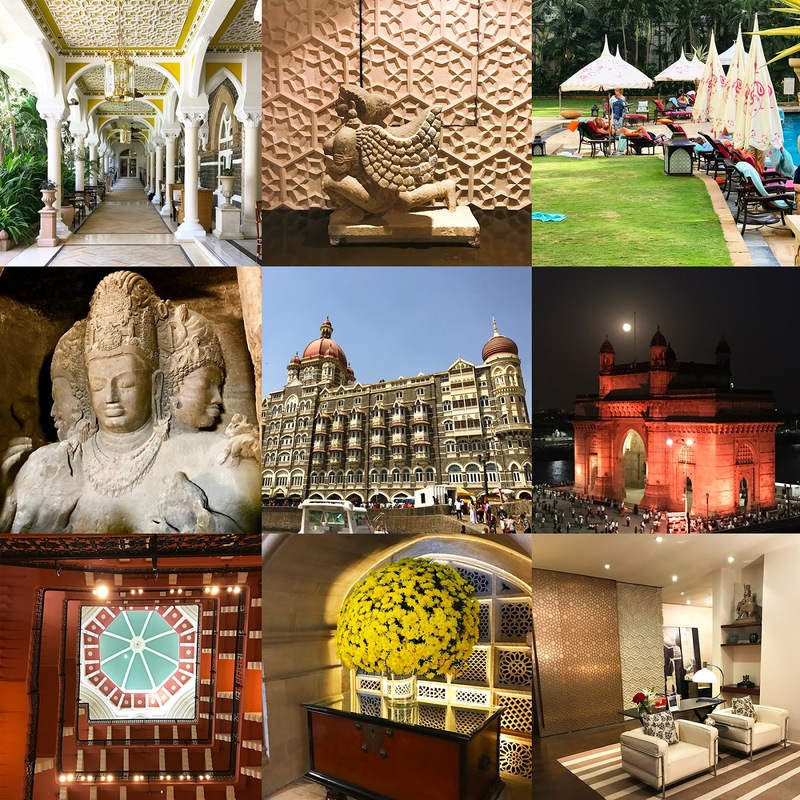 Whether the story is true or not, I am glad that this luxurious hotel was built as its imprint to the city of Mumbai is as important as the Gateway to India next to it. Originally the hotel had multiple entrances. In fact, its old entrances are where the pool is at right now. Currently the hotel has two reception areas. One is located at the Taj Mahal Tower which was a new wing that was added onto the hotel in 1973. This is the first reception one sees these days right after passing through the security zone. The other one is fairly close to the pool area which is the original reception of the hotel. Personally I like the old reception area much better as it retained its old world charm. If your room is in the old section of the hotel, you can take the elevators next to the central dome to reach your floor. The floor plan of the building is basically in the shape of letter C or a square with one side missing. The corridor of the hallway is extra wide as sky light from the roof distill day light down to hallways below. I imagine this was an effective way for the hotel to save electricity back in the day and today as well! There are a total of 5 floors plus ground floor or in the US it would be noted as the building has a total of 6 floors. The ground floor (in US first floor) is consist of public areas such as reception entry hall, bar, retail shops, and restaurants. The first floor (in US second floor) is mostly hotel rooms with one exception: the famous Sea Lounge facing the Arabian Sea! I was told many men propose to their girlfriends inside this particular lounge! The second floor and up are all hotel rooms. The corner rooms under the smaller domes are suites as well as most of the rooms in the top two floors of the hotel. The room we stayed in is called Elephanta Suites #361(category: Grand Luxury Suites) which is named after the famous Elephanta Caves not too far from Mumbai. The suite was quite spacious with a large bathroom with a free standing tub and a separate shower area, a bedroom, a living room, a vanity bathroom, a kitchenette, a dining room, and a sitting room. The decor style juxtapositions old world charm with modern furniture. I thought the suite was nicely done with the exception of sitting room area as there was a hodgepodge of furniture from many eras that crammed into a circular space. It felt disjointed and off. I get that the designer is trying to balance the space with modern and bygone era furniture but it just didn't work for me. I thought making that room as a yoga room, or a library makes much more sense. The best part of the room was the unrivaled view of the Gateway to India and Arabian Sea. It was magnificent. The Gateway to India looked stunning during the day as well as under a full moon. The suite also comes with the largest exterior balcony of the hotel facing Gateway to India which adds to its allure. Given how large the hotel is, I have to assume the service standard can't be that high. Well, I was wrong. The service standard at this particular Taj was as good as the Oberoi hotel in Agra. What this means is the service standard is higher than most Four Seasons hotel and Mandarin Oriental hotel you will ever come across. We were assigned a butler and he was fantastic. Upon returning after a day of traversing through the city of Mumabi, our room was spotless and shirts were pressed to perfection. Not to mention the last minute private heritage walk I requested and given by one of the hotel manager, I am thoroughly impressed by this hotel. They even brought us two bowls of rose pedal foot baths without us requesting. Knowing that our feet was tired after long day of walking. It was a lovely gesture. Food at the hotel was also delicious. I particularly liked the Masala Kraft restaurant which replaced their French restaurant. Their signature Indian restaurant has northern and southern Indian cuisine. I thought my chicken curry was delectable as well as naan bread which I could eat all day long. The weak link was the complimentary afternoon tea at the Palace Lounge which was only open to guests who stayed at suites. I thought the scones was a bit dry and I wish they have more selection of sweets as well as salty food. But the complaint is minor given how well I felt I was treated. Overall I would not hesitate to stay here again. I had thought about staying at the Oberoi Trident in Mumbai but I'm glad I stayed at the Taj Mahal Palace as location just can't be beat. I love the view of the Gateway to India and the Arabian Sea. I love that the private boat to Elephanta Island is literally across the street. And lastly, I love the architecture of the hotel; it absolutely magnificent.